We left Hope Vale exhilarated. Well, what a week! 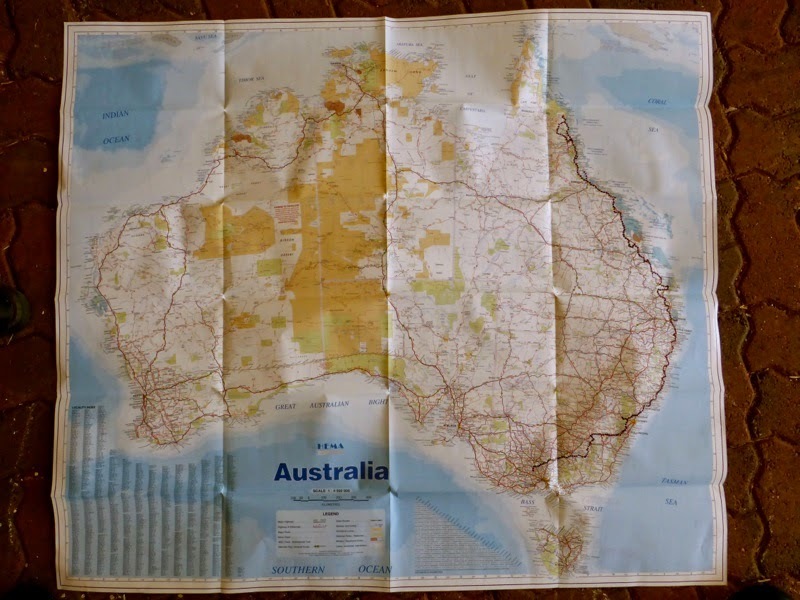 But we were somewhat overstimulated and oh so exhuasted, especially after we retraced our pedals on a large map of the country. 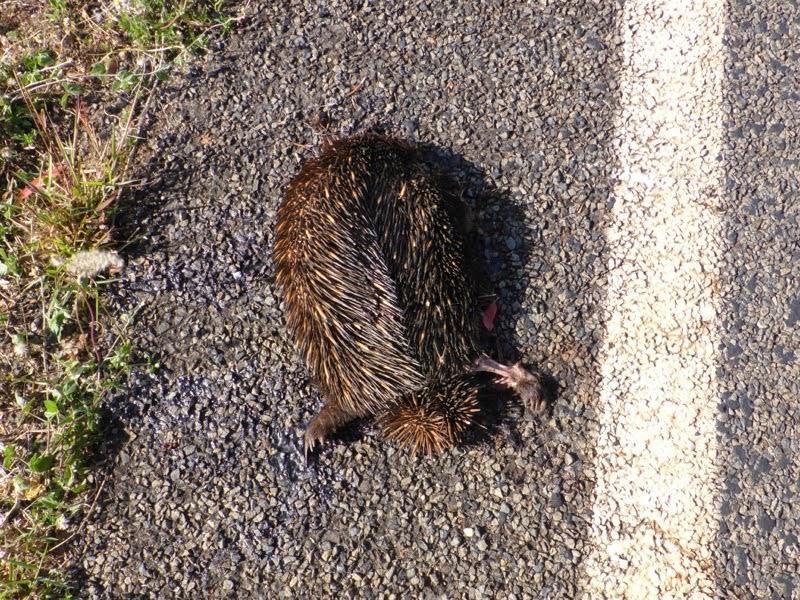 Woah, Daylesford to Hope Vale! 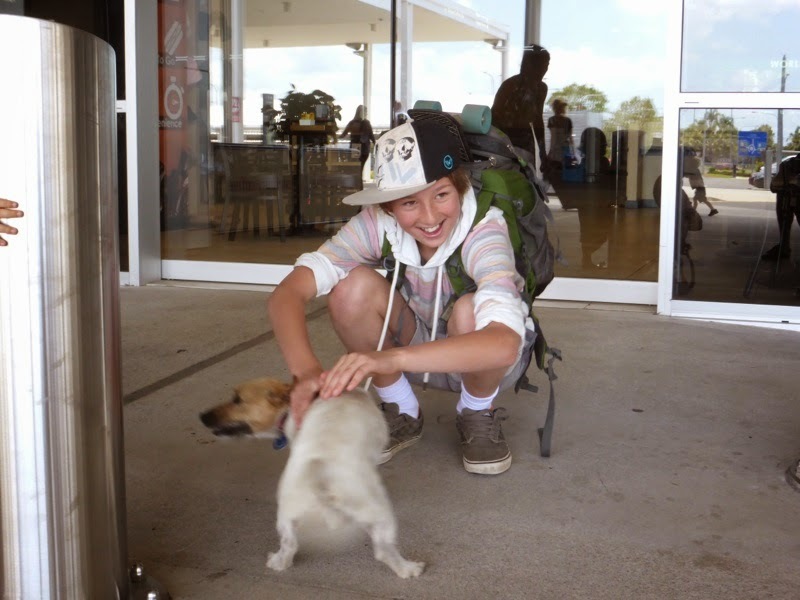 We smashed the record for the slowest transit on bicycle by a family riding with their dog-kin from southern Victoria to Cape York! Woohoo!! 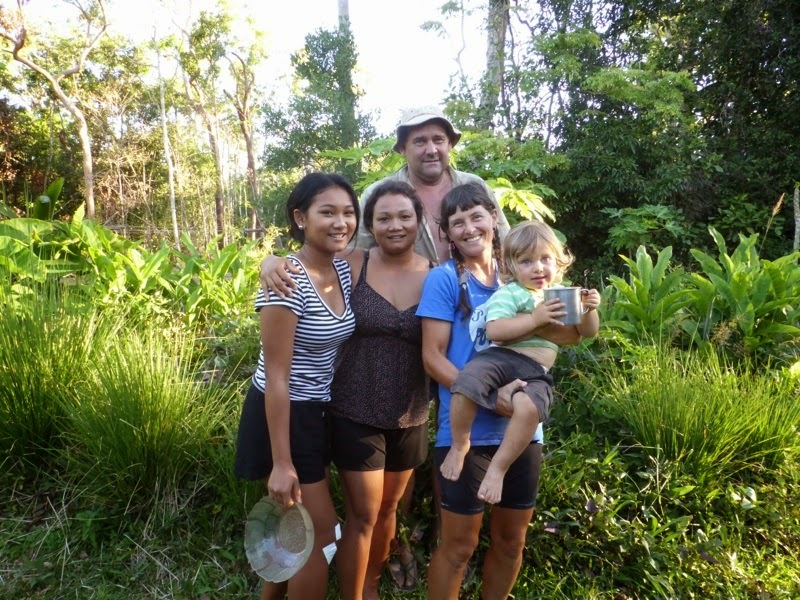 We hobbled south over bone-and-cog-shaking road down to Zazen, an organic Garden of Eden 40 kms south of Hope Vale. 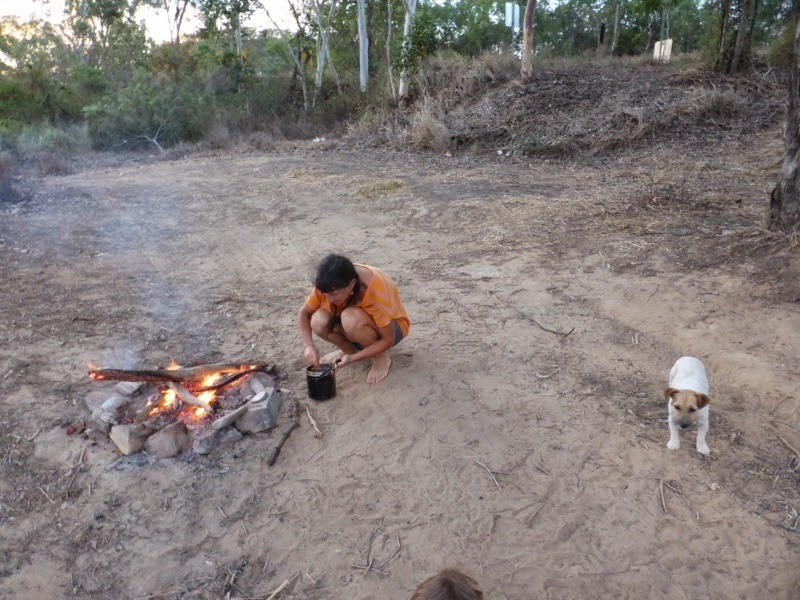 Peter, a former conventional WA wheatbelt farmer turned zen-permie, and Saeng, who grew up in Thailand and learned the pharmacopeia of traditional medicinal foods and ferments of her region, make an awesome partnership. 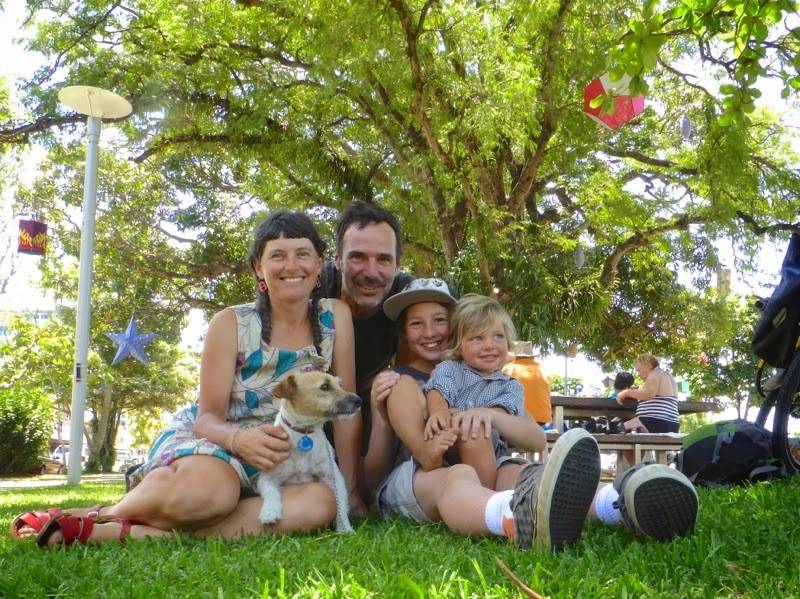 Saeng and Peter, pictured above with their daughter Bo and two-fifths of Artist as Family, know how to create abundance. They gave us a tour of their 5 acre garden, which remarkably is only a few years old. 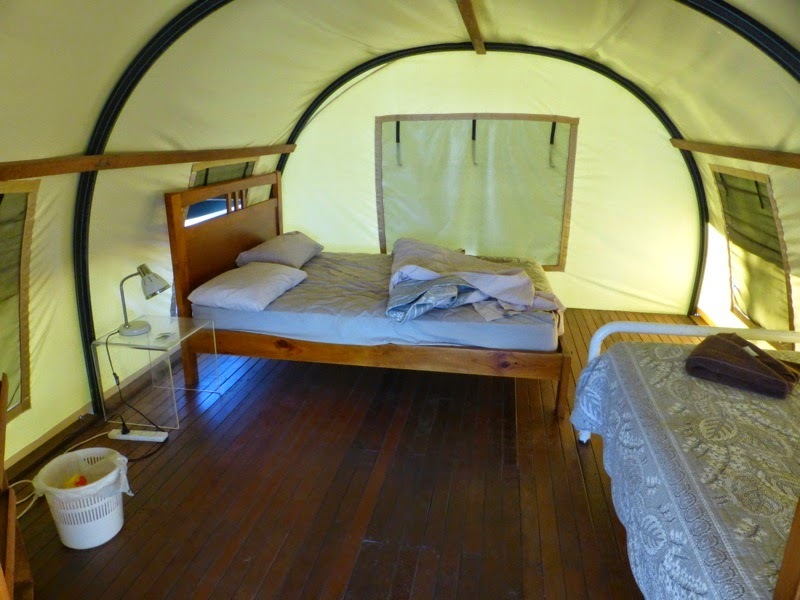 This is the wonderful WWOOFer lodgings Peter built, complete with mozzie net over the double bed. 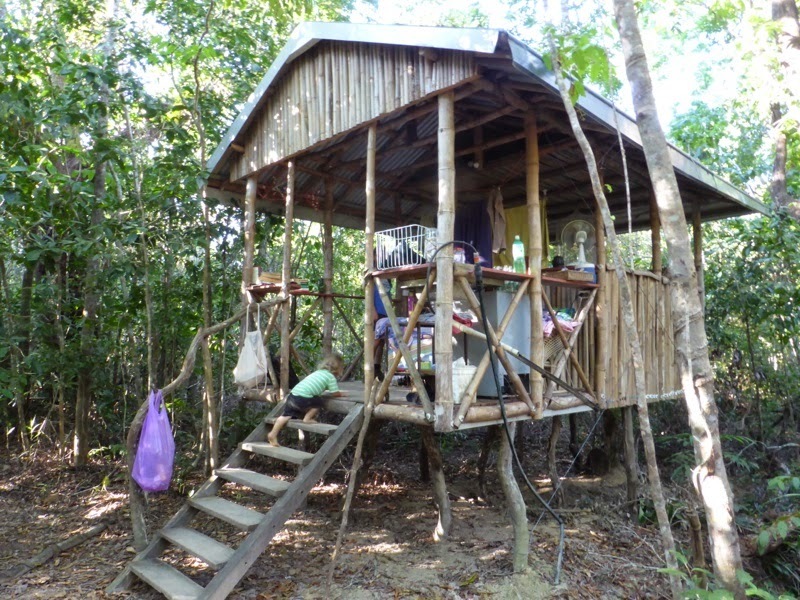 We were to stay there, but were beaten to it by Juz and Dave who were actually going to do some work at Zazen. 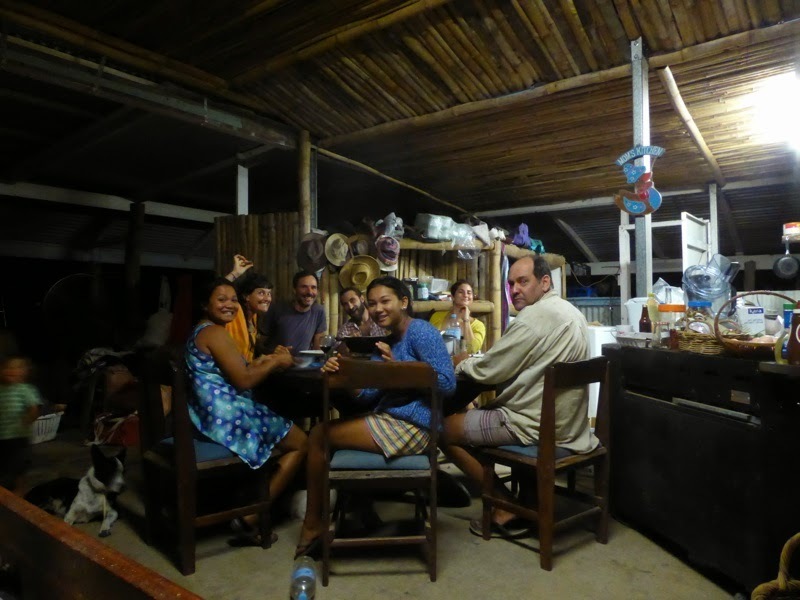 We all communed together in the main house, which spills into the garden with few walls, and Saeng cooked us a feast using mostly produce she had grown. Needless to say, the meal was delicious. We had a wonderful, but brief stay at Zazen. We were again inspired but still very overstimulated and needed some respite from all our incredible learning. We are overbrimming with knowledge and experience and we've had little time to process anything. We needed to become wandering mammals again. We needed a desert, at least a communications desert, to cross. 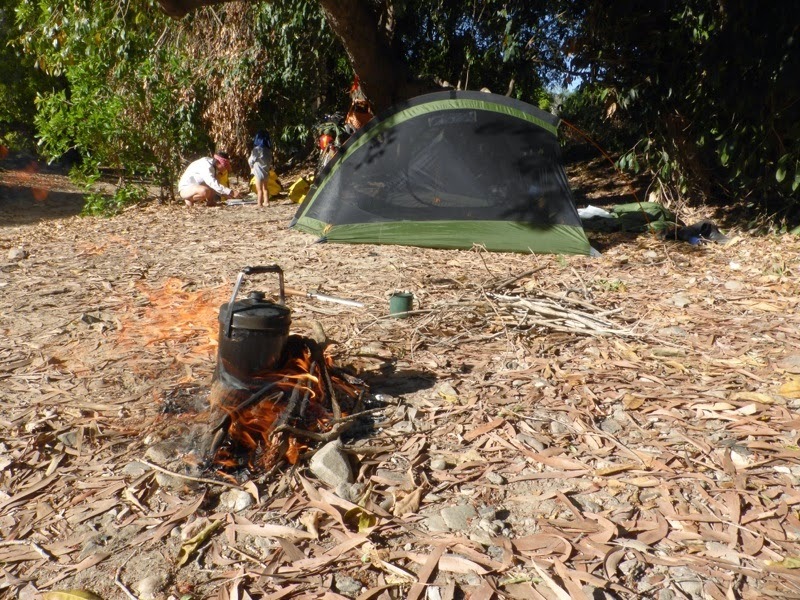 and set up camp in the open shelter there. 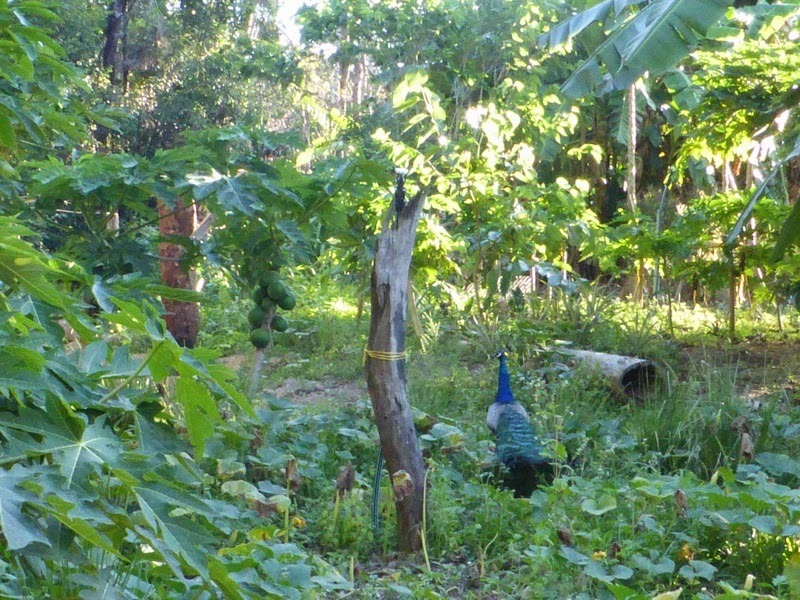 where we stayed with a gnostic farmer and teacher, Gary, and his many animals. 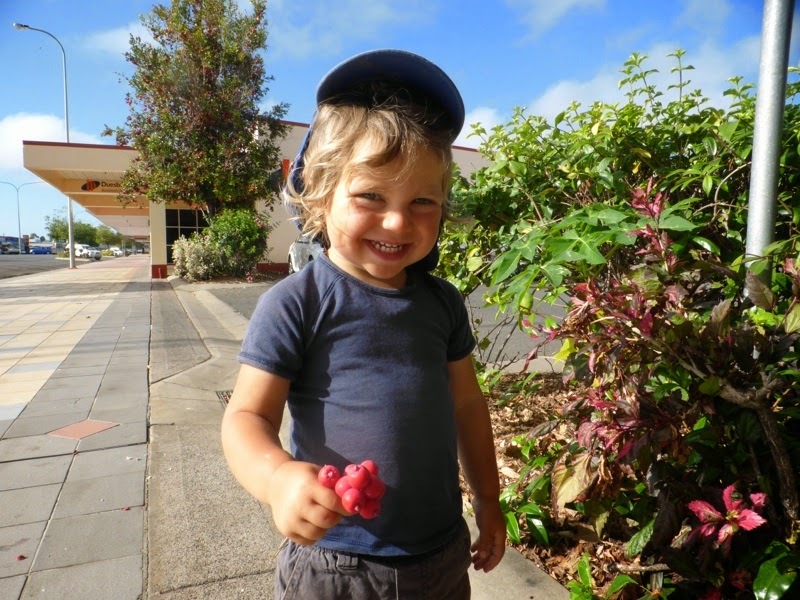 Again we were nourished by lovingly grown organic food. Thanks Gary! 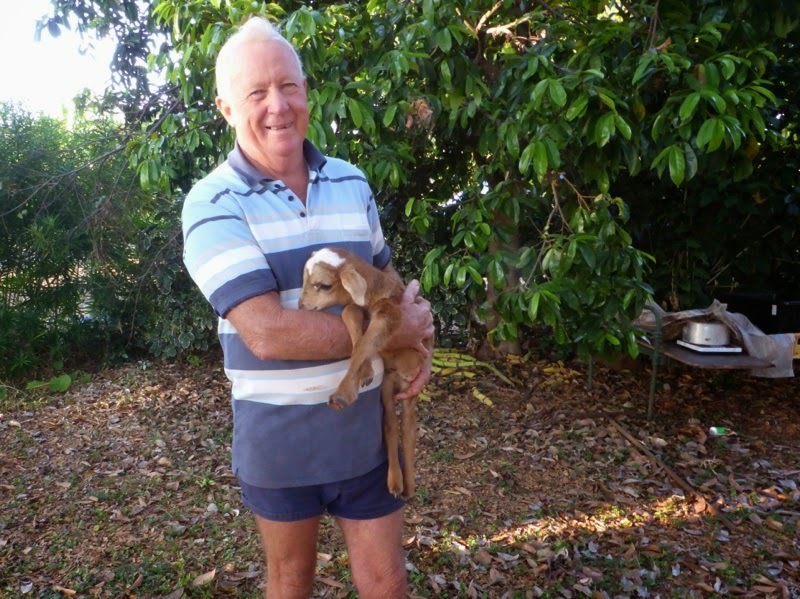 Gary has been teaching Indigenous kids in the NT and Cape York for the past 40 years. One of his students was Galarrwuy Yunupingu. 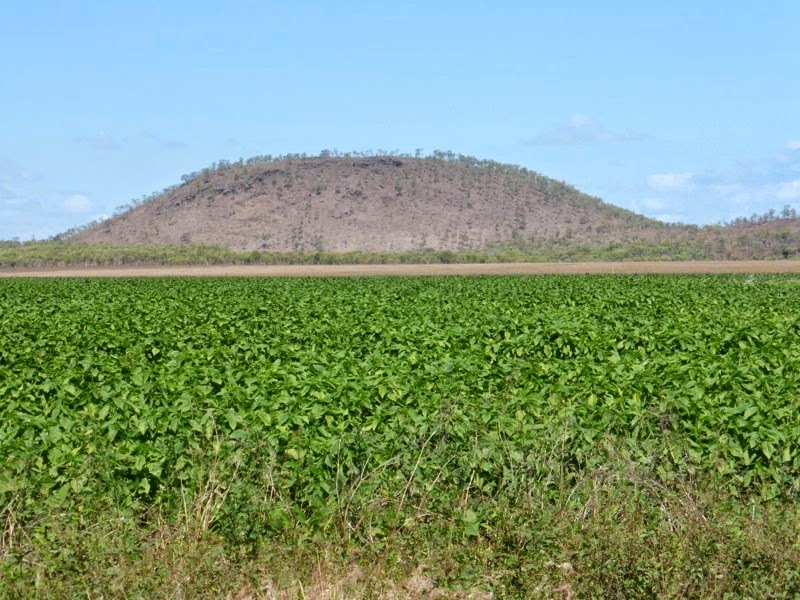 Gary drove us to the Aborignal settlement of Laura, passing a chia seed monoculture that had been planted across the old lands of the Uw Olkolo people. 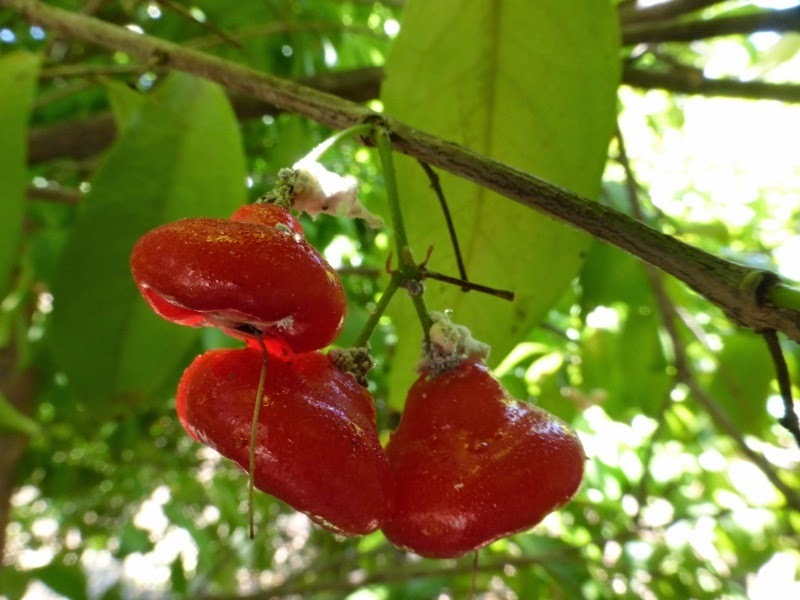 It was in Laura that we came across and tasted for the first time the very rare native water cherry (Syzygium aqueum), specific only to Cape York. This tree was planted at the Quinkan Regional and Cultural Centre. 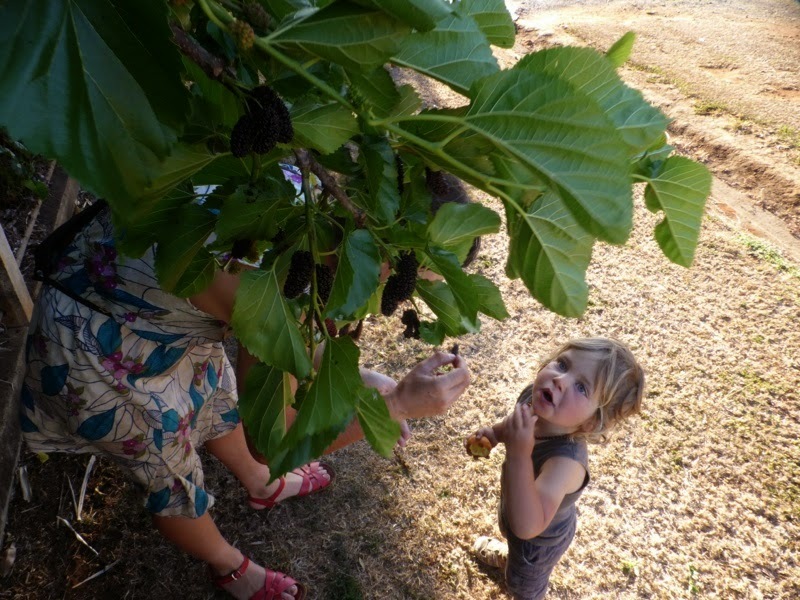 They were tart and needed further ripening, but we could see the potential once this fruit was further bletted or sun-dried for fruit leather. On leaving Gary in Lakeland we came across another traditional food of the region, only this time it hadn't been valued as food, rather wasted by speed. 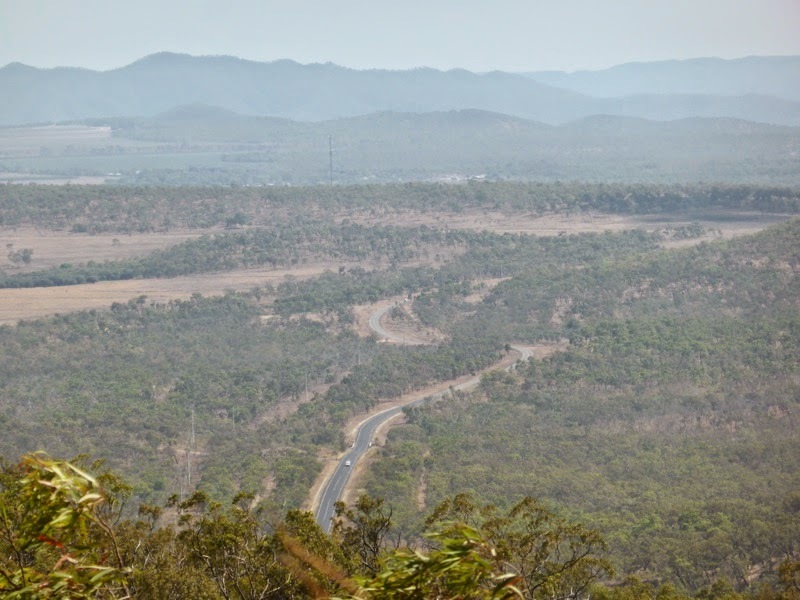 The trauma of Queensland roads has had a considerable effect on us, and soon we too will join the speed brigade as we hire a car to drop down south for a considerable part of our journey home. 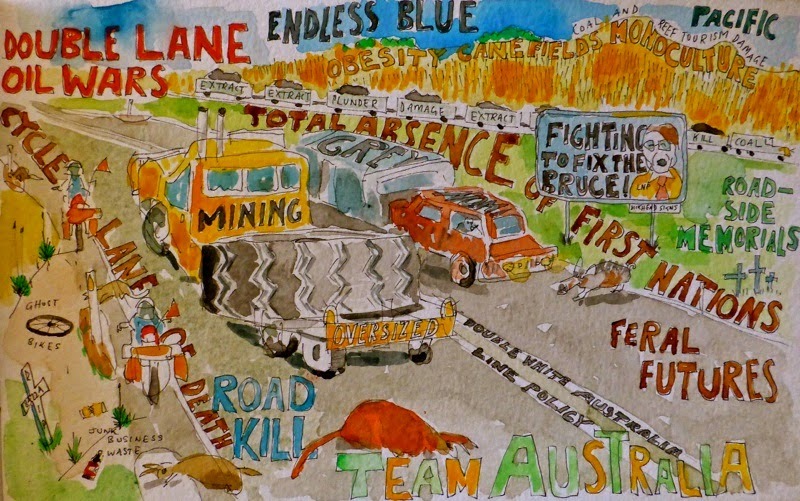 In a car, which we call a city on four wheels – walled off from the dust, pollens, stinging critters, blossoms, calls of animals and their rotting kin, air conditioned away from the relentless sun and radiation glare from the bitumen, unaware of the deafening grinding of truck and caravan gears, the groaning of engines and the fear of cyclists and other creatures travelling in ecological time and space – we know we will struggle with our momentary participation in such madness and privilege. But for the time being it's bums on well-worn leather. We climbed our first range on our southbound leg and took a breather here, looking down on where we'd come. 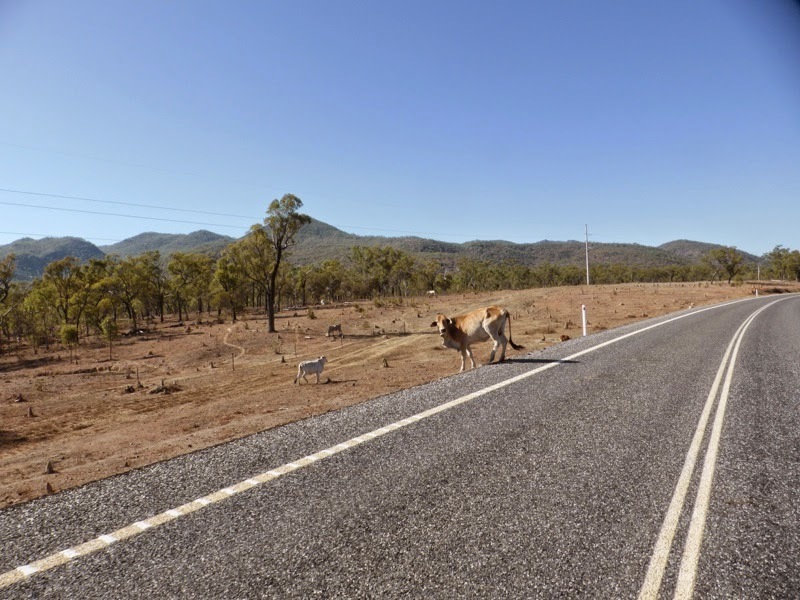 We shouted ourselves a $50 donga at the Palmer River Roadhouse, blowing our daily budget to pieces. 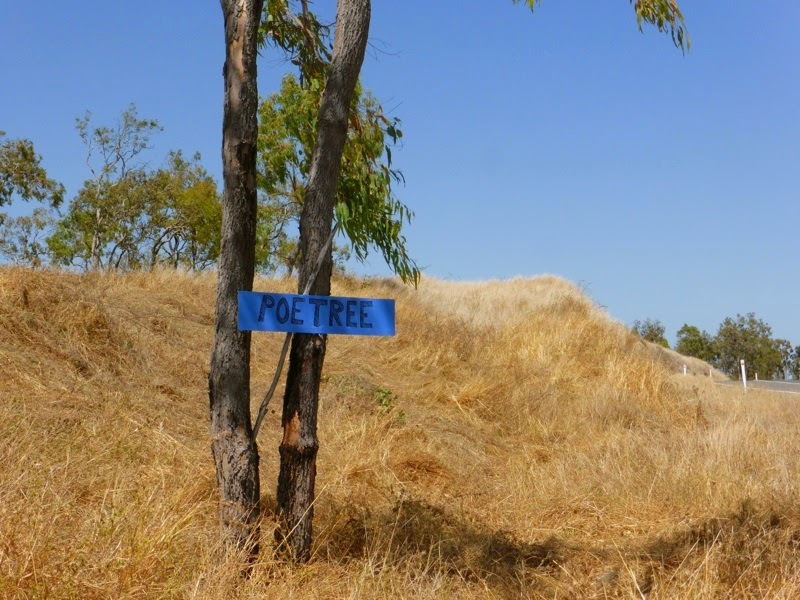 or the poetree of the place. A wordless blue sign nailed to a eucalypt is a very beautiful thing, but we couldn't resist embellishing it. Then, another first. 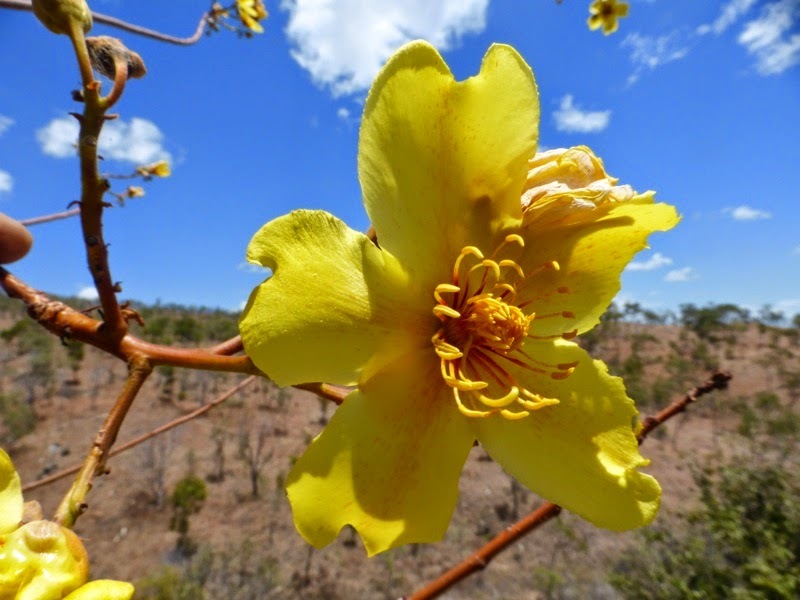 Native Kapok Bush (Cochlospermum fraseri). The petals can be eaten raw, which we loved, and the roots are best roasted, apparently. Inside the pods of this bush is the kapok, which when dry makes an excellent fire starter. 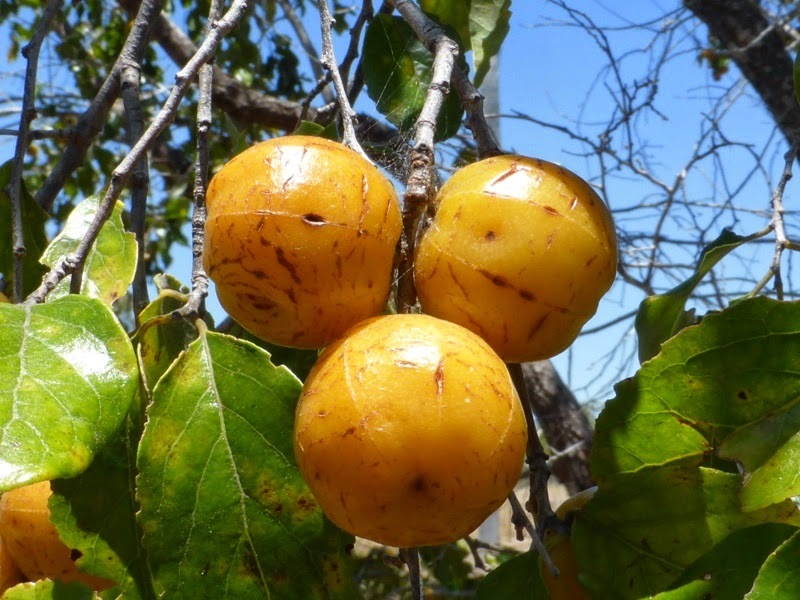 and we found other new fruits such as these on the Quinine Tree (Petalostigma pubescent), which were thought to contain the malaria fighting drug quinine, but actually doesn't according to a James Cook University study. The traditional uses of the fruit include holding the fruit in the mouth to relieve toothache and chewing the fruit to avoid pregnancy. 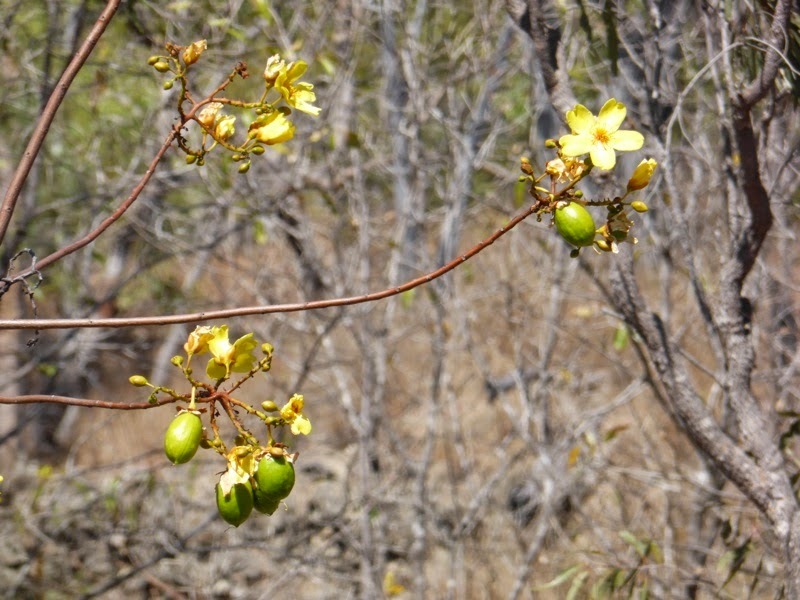 The bark has been used to make an antiseptic wash and the bark and fruit used to make an eye drop. We crawled into Mt Molloy. 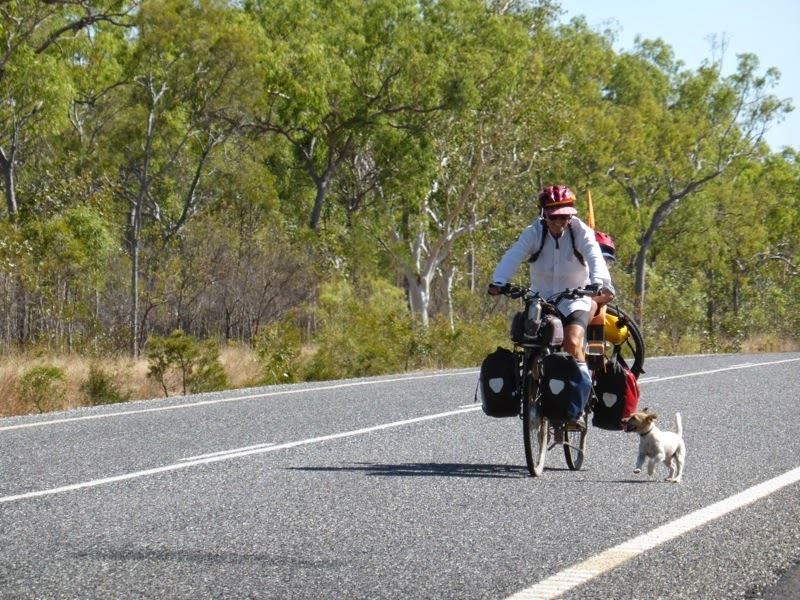 Do motorists feel headwinds? We can't remember. 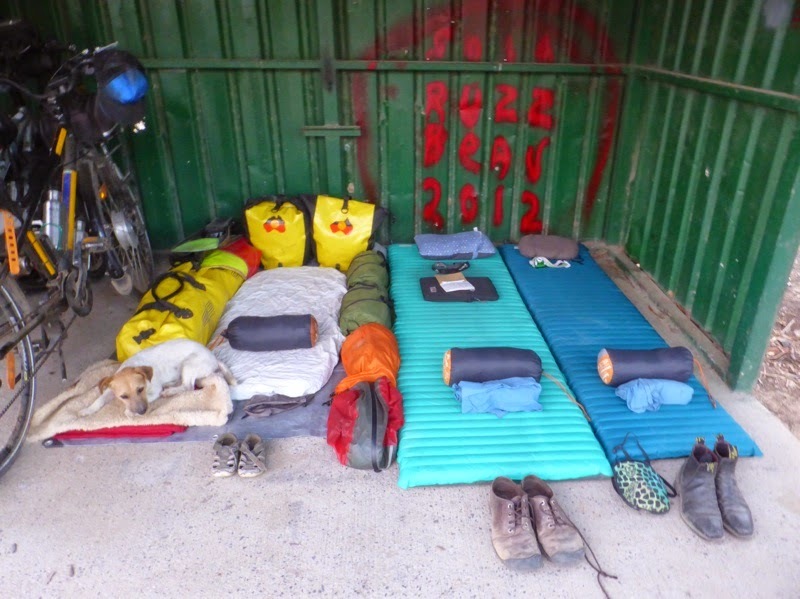 The publican at Mt Molloy let us camp at the back of the hotel for free so we obliged him by buying a few beers. Thanks Scott! 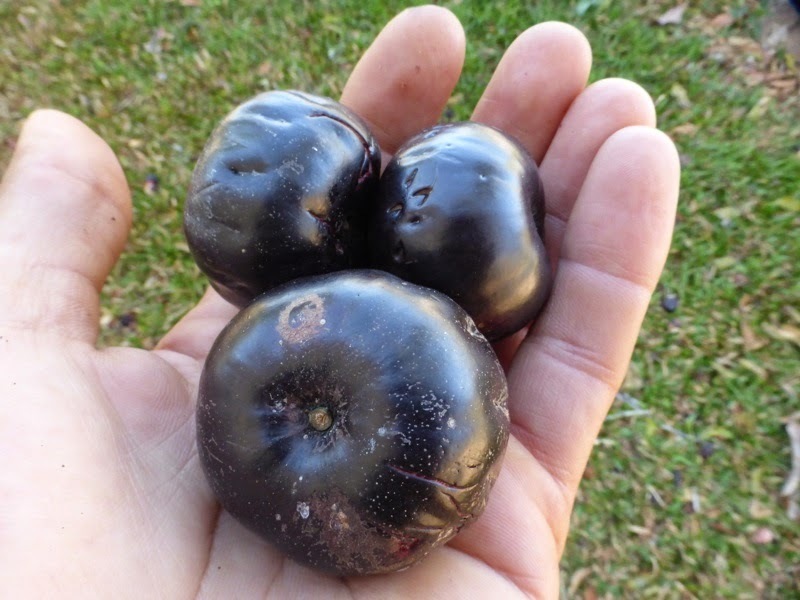 On the way out of town the next day we filled a bag with fallen Burdekin plums (Pleiogynium timorense), which fuelled us to Mareeba. 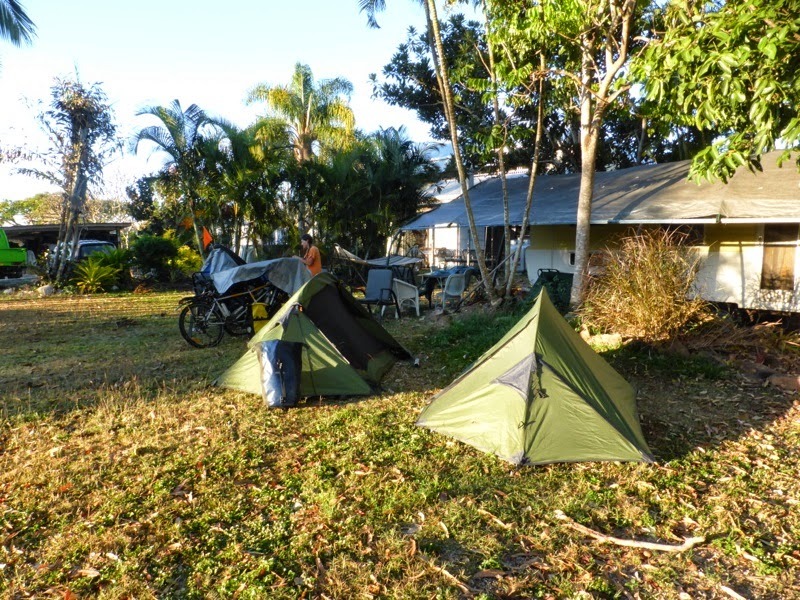 We left Mareeba and rode towards Kuranda. 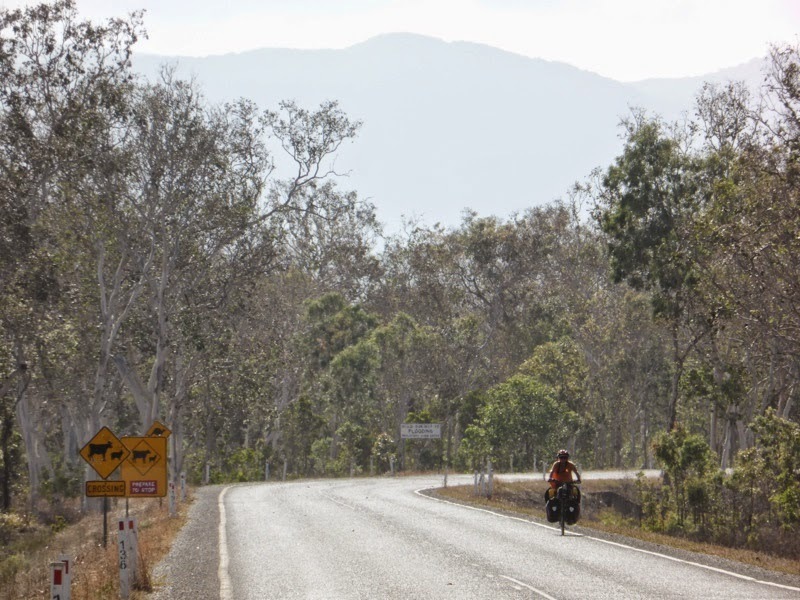 Some motorists had told us it was all down hill from Mareeba to Cairns, but it was nothing like it. 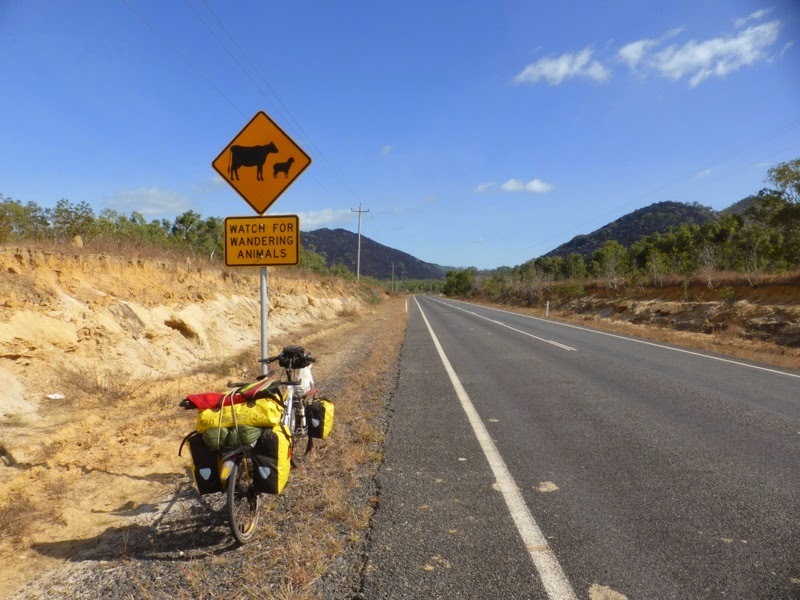 To listen to motorists who don't ride bikes is a consistent mistake we've made on this trip. 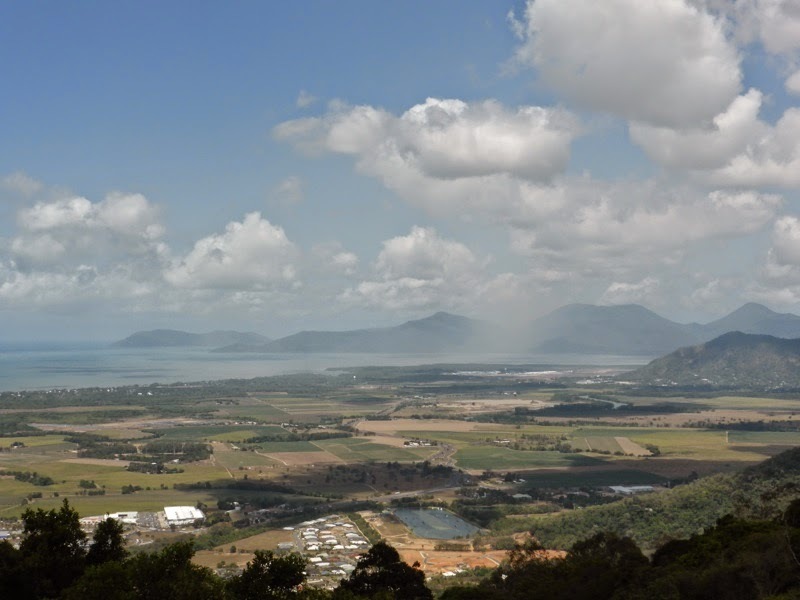 The cool and rainforested entry into Kuranda was a treat, after a shoulderless and hot hike along the busy Kennedy Highway, but the village itself was less than interesting. 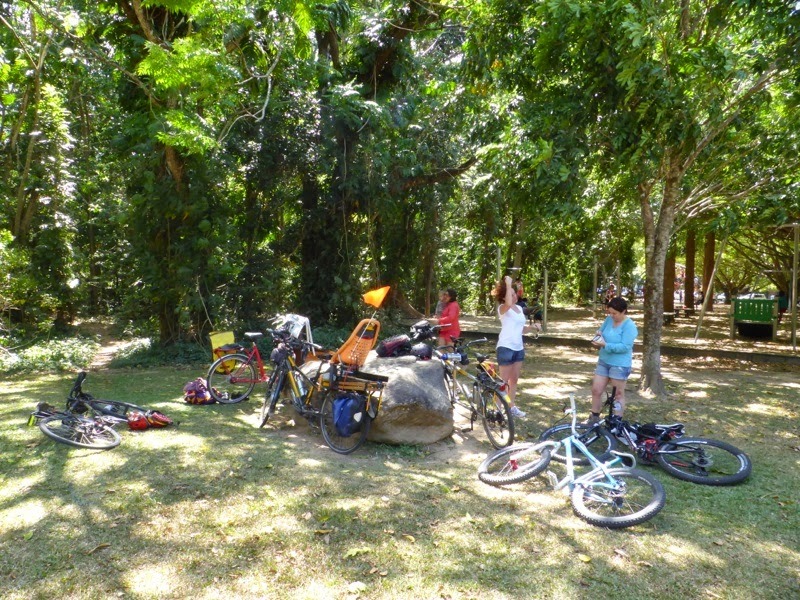 If you like tourist havens you'll love this place, but for us we high-tailed the tandem and long-tail out of there, after finding little but trinkets and shyster businesses. We headed up the range for several kms (with an emphasis on up) until we could finally come down. and the return (from the sky) of the wonderful Zephyr! After an absence of six months (in which time Zeph was playing for Ballarat U13s in the National Premier League, while being home educated by his mum Mel and our dear friend, teacher and poet, Peter O'Mara), we are once again five happy mammals on two bikes. We hope you too, Dear Readers, are happy mammals enjoying simple pleasures with kin and loved ones. Thanks for saying Jude, it's certainly been interesting to see how the ups dovetail into the downs and vice-versa. Totally agree with Jude T! I read your blog with my two young sons. We look forward to each new post. Thanks for the inspiration and congratulations on your journey so far. Thanks Jayne, it is so rewarding to get comments like yours and Jude's. Thanks for the support. Hi boys! been following and reading since you left Daylesford. Great stuff! Thanks UM, we appear so green looking back to the first few posts. I am so happy to have found your blog tonight when I was researching camp grounds, and to be able to read your writing all at once. But so sad I haven't been to join you from the beginning - you're just about to finish as I have just started reading through all that you've achieved. This is great! Ellie.